Yangon, Myanmar -- A new alliance is beginning to take shape in South and Southeast Asia with the news that the Bodu Bala Sena (Buddhist Power Force) has invited Wirathu, leader of the 969 movement in Burma, to visit them in Sri Lanka. There is clearly a new phenomenon emerging and a new term is needed to describe precisely what is happening on the ground with this collection of new Buddhist alliances. There has been much talk of “Buddhist terror”, “extremist Buddhism” and most famously, “the face of Buddhist terror”, however these headlines are sensationalist. A more subtle and nuanced description is needed, focusing upon key features of this new phenomenon in Buddhism taking shape in Burma and other parts of the world, notably Sri Lanka. 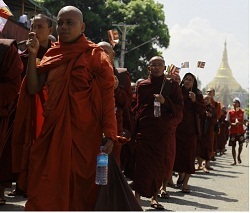 There have been those who have commented upon the supposed use of Buddhism by the National Religious Protection Group (NRPG), a group headed by Wirathu, a vanguard leader of ultra-nationalism in Burma. It has also been suggested that the ruling party in Burma, the Union Solidarity and Development Party (USDP) are manipulating notions of Burmese identity with those of Buddhist identity. However, there is no clear consideration of these elements from the historical perspective of Buddhist ideas. “Ethnocentric Buddhism” is a term I have begun to use to describe a particular phenomenon in the history of Buddhism, although I suspect it is not a recent one. The term points to the notion that Buddhist identity is intrinsically linked to national identity. It also denotes the idea that other factors will be apparent in creating Buddhist and national identity in different Buddhist cultures. For example, in Thailand there is the idea of “nation, religion and monarch” (chat-sasana-phramahakasat) and in Burma “nation, language and religion” (amyo-barthar-tharthanar). In both of these examples the idea of the Buddhist religion (sasana/tharthanar) is linked to other factors in the formation of national and cultural identity. Further, in both cases the defence of one’s religion is linked to these other themes of national identity — to defend one is to defend the other. There are a number of possible factors and ideas that could shape the formation of an ethnocentric type of Buddhism in a given country. Not all of these ideas are available in each cultural context. Some are available across Buddhist Asia, some confined to a particular area, or would have been used during different historical periods. There is the idea of the “true dharma” existing in one particular place and of that location preserving this true version of the Buddha’s teachings. For example, in Sri Lanka after the transmission of Buddhism, some aspects of the Pali Canon would be considered to preserve the essential word of the Buddha. Later, national identity could be built around this idea together with other texts being used and composed together with Buddhist symbols, the tooth relic for example, creating the notion of a direct lineage to the Buddha. This is clearly linked to the idea of a particular text containing the essential teaching of the Buddha. The so called “Lotus-sutra (Saddharma-Pundarika-sutra) is the best know example, but there are many others. The Abhidhamma could be said to serve a similar purpose in South and Southeast Asian Buddhism. The notion of the decline of the Dharma in its various manifestations (mappo, for example) is clear — the teachings last a set period of time and this lends itself to an urgency for a given people to preserve and defend the teachings of the Buddha. There is the idea that Buddhism is threatened and that there is a very real need to uphold Buddhism because of this threat. The teachings can be corrupted. The idea that the teachings can be corrupted is written into the Buddhist narrative DNA. This in turn gives rise to a natural sense of “Buddhist nationalism”. What is essential to the tradition is emphasized and “Buddhist fundamentalism” comes to the fore when the “other” is polarised as a threat to the future of Buddhism. In turn Buddhism is linked to ethnicity — a particular ethnic group is under threat and have the need and the necessity to preserve the teachings of the Buddha. Other ethnic groups, unless they come under the control of the dominant Buddhist group are a threat. Movements like the so-called 969 movement in Burma and the Bodu Bala Sena (Buddhist Power Force) in Sri Lanka exemplify some of these ideas. A possible Islamophobic Buddhism and the Buddhist Defence League are other examples. Unlike in “protestant Buddhism”, where the laity have enhanced importance, the monastics, with all of their symbolic importance are again at the top of the hierarchy of ethnocentric Buddhism. The traditional hierarchical nature of Buddhist culture is returned. The monastics cannot be questioned in their symbolic roles as the direct link between the layperson and the overcoming of dukkha. Once again the aspiration is to one day be reborn, when one can go from home to homelessness and renounce society. This will only be possible if the monastics of the present preserve the Dharma for that future rebirth. Finally, linking many of these ideas is that of an emerging sense that blasphemy is being committed against Buddhism. Blasphemy is not usually an idea associated with Buddhism but it is coming to prominence in what I am terming ethnocentric Buddhism. It could increasingly be argued that it has indeed been a component, an often prominent one, in other historical periods and might be linked to textual ideas of the sanctity of the Buddha and his tradition. All of these factors are giving rise to this new phenomenon in Buddhism. We should not term it “Buddhist terror” or “the face of Buddhist terror” but attempt to understand this phenomenon on its own terms in the history of Buddhist doctrine and Buddhist practice. Dr Paul Fuller has taught Religious Studies at Universities in Southeast Asia, the University of Sydney in Australia and at Bath Spa University in the UK. His research interests include early Indian Buddhist philosophy and the Buddhist ideas of Aung San Suu Kyi. His book, The Notion of Ditthi in Theravada Buddhism: The Point of View (RoutledgeCurzon Critical Studies in Buddhism, 2004) explores the textual basis of discrimination and attachment in the Pali Canon.